KALLIOPE (pronounced ka-LIE-oh-pee) is the Greek Muse of eloquence and epic poetry. She is the eldest of the nine Muses, daughters of Zeus and Mnemosyne. With Oiagros, King of Pieria, she was the mother of Orpheus, a poet and bard. 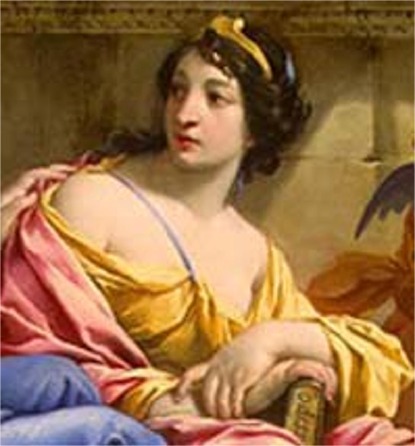 Kalliope inspired Homer to write "The Iliad" and "The Odyssey", and arbitrated in a dispute between Aphrodite and Persephone over Adonis.She is usually depicted carrying a scroll or a book, and carrying a stylus. Kalliope's name, which means "beautiful voiced," is also see as KALLIPEIA, CALLIOPE, and CALLIOPEA, and epithets used to describe her include CLEAR-VOICED, EXCELLENT, and WHITE-ARMED. According to Beaumont, the above is the most authentic form of the Delphian tripod extant; but as the tripod must have changed considerably during the life of the oracle, hasty conclusions are unwise. 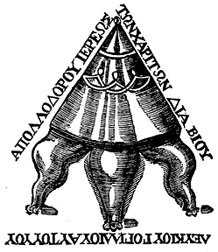 In his description of the tripod, Beaumont divides it into four parts: (1) a frame with three feet; (2) a reverberating basin or bowl set in the frame; (3) a flat plate or table upon which the Pythia sat; and (4) a cone-shaped cover over the table, which completely concealed the priestess and from beneath which her voice sounded forth in weird and hollow tones. Attempts have been made to relate the Delphian tripod with the Jewish Ark of the Covenant. The frame of three legs was likened to the Ark of the Covenant; the flat plate or table to the Mercy Seat; and the cone-shaped covering to the tent of the Tabernacle itself. This entire conception differs widely from that popularly accepted, but discloses a valuable analogy between Jewish and Greek symbolism. AKRAIA (pronounced ah-CRY-uh) is one of the Greek Naiades. The Naiades were generally thought to be daughters of an Okeanid mother (the 3000 daughters of Tethys and Okeanos, Goddesses of fresh water sources) and a Potamoi father (the 3000 sons of Tethys and Okeanos, Gods of the rivers); in Akraia's case, her father was Asterion, God of the River Asterion near Mycenae. Along with her sisters Euboia and Prosymna, Akraia nursed the Goddess Hera when she was an infant, and her name was later used as one of Hera's epithets. Akraia's name, which means "of the heights," is also seen as ACRAEA. DEMETER (Roman name Ceres) was the goddess of agriculture who brings forth the fruits of the Earth, particularly the various grains.. Demeter as the sister of Zeus and the mother of Persephone. She taught mankind the art of sowing and ploughing so they could end their nomadic existence. As such, Demeter was also the goddess of planned society. She was very popular with the rural population. As a fertility goddess she is sometimes identified with Rhea and Gaia. Persephone was gathering flowers in a meadow one day when a huge crack opened up in the earth and Hades, King of the Dead, emerged from the Underworld. He seized Persephone and carried her off in his chariot, back down to his his realm below, where she became his queen. Demeter was heartbroken. She wandered the length and breadth of the earth in search of her daughter, during which time the crops withered and it became perpetual winter. At length Hades was persuaded to surrender Persephone for one half of every year, the spring and summer seasons when flowers bloom and the earth bears fruit once more. The half year that Persephone spends in the Underworld as Hades' queen coincides with the barren season. 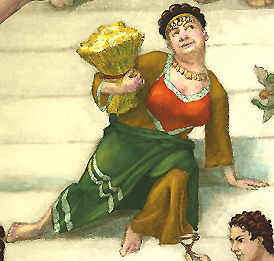 When depicted in art, Demeter is often shown carrying a sheaf of grain. In systematized theology, Demeter is a daughter of Cronus and Rhea and sister of Zeus by whom she became the mother of Persephone. When Persephone was abducted by Hades, lord of the underworld, Demeter wandered the Earth in search of her lost child. During this time the Earth brought forth no grain. Finally Zeus sent Hermes to the underworld, ordering Hades to restore Persephone to her mother. However, before she left, Hades gave her a pomegranate. When she ate from it, she was bound to spend a third of the year with her husband in the infernal regions. Only when her daughter is with her, Demeter lets things grow. The dying and blossoming of nature was thus connected with Demeter. In the Eleusinian mysteries, Demeter and Persephone were especially venerated. When she was looking for her daughter, in the shape of an old woman called Doso, she was welcomed by Celeus, the king of Eleusis. He requested her to nurse his sons Demophon and Triptolemus. To reward his hospitality she intended to make the boy Demophon immortal by placing him each night in the hearth, to burn his mortal nature away. The spell was broken one night because Metanira, the wife of Celeus, walked in on her while she was performing this ritual. Demeter taught the other son, Triptolemus, the principles of agriculture, who in turn, taught others this art. In Demeter's honor as a goddess of marriage, women in Athens, and other centers in Greece, celebrated the feast of Thesmophoria. Throughout Classical times members of all social strata came from all parts of the Mediterranean world to be initiated in and celebrate her Mysteries at Eleusis. 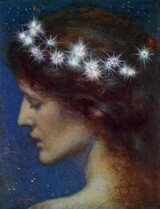 In ancient art, Demeter was often portrayed sitting as a solemn woman, often wearing a wreath of braided ears of corn. Well-known is the statue made by Knidos mid-4th century B.C.E. Her usual symbolic attributes are the fruits of the earth and the torch, the latter presumably referring to her search for Persephone. Her sacred animals were the snake and the pig. Some of her epithets include Auxesia, Deo, Chloe, and Sito. The Romans equated her with the goddess Ceres. KAMRUSEPAS is the Hittite Goddess of healing and magic. She was able to cure paralysis and other illnesses, by unbinding the illness from the worshipper. When the fertility God Telepinu had left the world in a rage, resulting in widespread famine, it was Kamrusepas who was finally able to subdue his anger with her rituals. After calming him with honey and fruit, her magic captured and banished his anger to the underworld. Kamrusepas is also known as KAMRUSHEPASH, KAMMARUSHEPASH, KATAHZIPPURI, KATAHZIPURI, and KATAHZIWURI. CH'ANG-O is the Chinese Goddess of the moon. 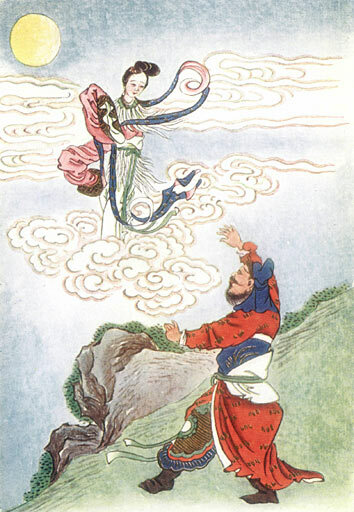 She and her husband Houyi, God of archery, lived in the heavens with the other immortals. Their fall from grace came about after the Jade Emperor's ten sons turned themselves into ten suns. Their combined power was too much for the earth, and it began to scorch. The Jade Emperor could not persuade his sons to stop, and he asked Houyi to help. Houyi was only supposed to scare the sons with his arrows, but he was so angry with the destruction that they were causing that he shot nine of them down. The Jade Emperor was furious and banished Houyi and Ch'ang-O to the earth to live as mortals. Seeing how the loss of immortality saddened Ch'ang-O, Houyi set out to find Hsi Wang Mu, the Goddess of immortality. She agreed to give him the elixir of immortality and warned him that there was just enough for himself and Ch'ang-O. Houyi returned home with the elixir, but was called away before he had a chance to take any or to tell Ch'ang-O what it was. Her curiosity got the better of her, and she drank the potion to see what it would do. Just as Houyi was returning home, Ch'ang-O started to float up to the heavens. Houyi tried to reach to her, but she had floated too far. She continued upwards until she landed on the moon, and there she stays. Her only companion is a jade rabbit, who works to make another immortality elixir for Houyi, so that they can be reunited. Ch'ang-O's name is also seen as CHANG'E, CHANG-O, and HENG-O. Indra is the King of the gods or Devas and Lord of Heaven or Svargaloka in Hindu mythology, and also he is the God of War, Storms, and Rainfall. Indra figures as one of the chief deities in the Rigveda, celebrated as the slayer of Vtra and central to the Soma sacrifice. He has many epithets, notably van the bull, and vtrahan, slayer of Vtra. 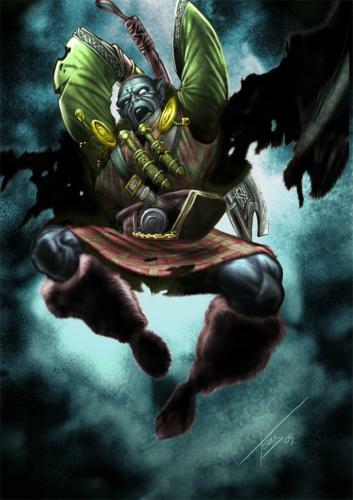 Indra appears as the name of an arch-demon in the Zoroastrian religion, while Verethragna appears as a god of victory. 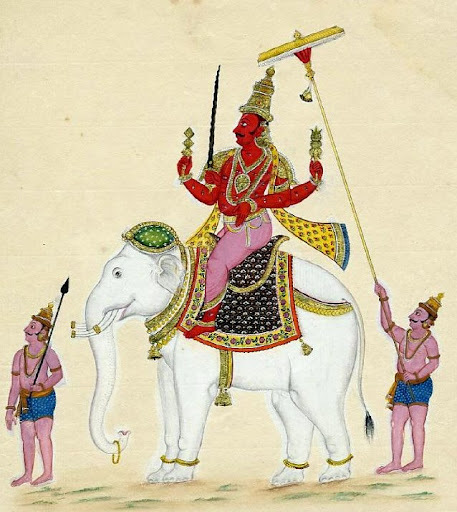 In Puranic mythology, Indra is bestowed with a heroic and almost brash and amorous character at times, even as his reputation and role diminished in later Hinduism with the rise of the Trimurti. In Buddhist tradition, Indra is also called; in Thai as Phra Intra, in Malay as Indera, in Tamil as Intiran, in Chinese as D`ish`itian, and in Japanese as Taishakuten. Camulus or Camulos was a theonym for a god whom the Romans equated with Mars by interpretatio romana. He was an important god of early Britain and Gaul, especially among the Belgae and the Remi, a Gaulish tribe who lived in the area of modern Belgium. At Rindern, France, he was cited as Mars-Camulos on a stone with a corona of oak. Elsewhere he was portrayed with a ram-horned head. Evidence of his popularity can be seen in several place-names notably Camulodunum. Attempts to link him with the nursery character Old King Cole and Fionn's father Cumhall have been rejected by contemporary learned commentators The town Camulodunum in Essex may have been named after him. Cotterell claimed that this was the basis for the legendary city Camelot. Cunobelinus, Shakespeare's Cymbeline, a chief of the Catuvellauni who was called Britannorum rex by the Roman historian Suetonius, made Camulodunum his capital after defeating the local Trinobantes. He established a mint there, and coins bearing his head are still found occasionally in the area. After his death around AD 42, his sons fell out with Rome and gave the emperor Claudius an excuse to try to place Britain under Roman rule. THE HORAE (HOURS) WERE THE GREEK AND ROMAN GODDESSES OF TIME; THEY RULED OVER THE SEASONS AND EVERY HOUR OF THE DAY. THEY WERE BORN FROM THE UNION OF ZEUS AND THEMIS. THERE WERE ACTUALLY TWO GENERATIONS OF HORAE. 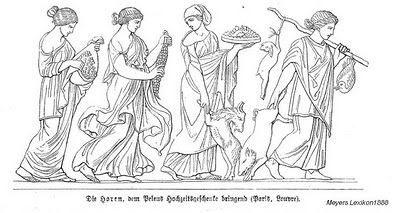 THE ANCIENT GREEKS ONLY RECOGNIZED THE SEASONS--SPRING, SUMMER, AND AUTUMN--SO THE FIRST GENERATION CONSISTED OF ONLY THREE GODDESSES--THALLO (SPROUTING), AUXO (GROWTH), AND CARPHO (WITHERING). THEY REFLECTED THE THREE FORCES AT WORK IN THE CYCLE OF NATURE. THALLAS, THE GODDESS OF SPRING WAS THE BRINGER OF THE FLOWERS, A PROTECTRESS OF YOUTH. AUXO WAS THE GODDESS OF THE SUMMER AND THE GROWTH OF THE CROPS. CARPHO WAS IN CHARGE OF THE AUTUM, THE RIPENING OF THE FRUITS, THE HARVESTING. THE SECOND GENERATION COMPRISED EUNOMIA (LAWFUL ORDER), DIKE (JUSTICE), AND EIRENE (PEACE). NOTICE HOW THE HORAE HAVE CHANGED FROM ONE GENERATION TO THE NEXT. IT WAS ONLY NATURAL THAT BECAUSE THEY WERE ORIGINALLY THE GODDESSES OF ORDERLY THINGS SUCH AS THE SEASONS, THAT THEY WOULD BECOME THE GODDESSES OF JUSTICE. SO, WE BEGAN WITH A TRIO OF YOUNG, BEAUTIFUL GODDESS WHO RULED OVER THE SEASON, AND THE NEXT GENERATION IS MAINTAING THE STABILITY OF THE SOCIETY. EUNOMIA, DIKE, AND EIRENE WARE USUALLY DEPICTED AS YOUNG MAIDENS WITH BEAUTIFUL, FLOWING HAIR AND A LIGHT FOOTSTEP. EUNOMIA WAS THE GODDESS OF LAW AND LEGISLATION. DIKE WAS THE GODDESS OF MORAL JUSTICE. SHE RULED OVER HUMAN JUSTICE WHILE HER MOTHER, THEMIS, RULED OVER DIVINE JUSTICE. DIKE HAD BEEN BORN A MORTAL, AND ZEUS PLACED HER ON EARTH TO KEEP MANKIND JUST. THIS QUICKLY PROVED AN IMPOSSIBLE JOB, AND HE REMOVED HER FROM EARTH, PLACING HER NEXT TO HIM ON OLYMPUS. FINALLY, LOSING HOPE FOR HUMANITY ALTOGEHTER, SHE ASCENDED TO THE HEAVENS AND BECAME THE CONSTELLATION VIRGO. EIRENE WAS THE PERSONIFICATION OF PEAE AND WEALTH AND WAS USUALLY DEPICTED AS A BEAUTIFUL YOUNG MAIDEN CARRYING A CORNUCOPIA, SCEPTER, AND A TORCH. Centeotl (also known as Centeocihuatl or Cinteotl) is the masculine deity of maize. 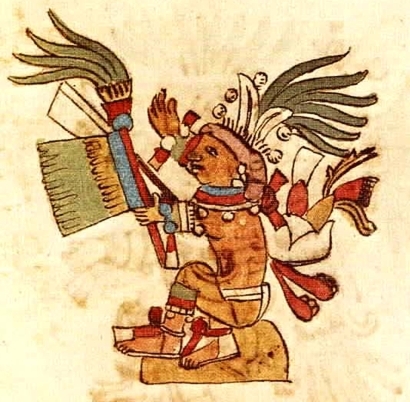 According to the Florentine Codex,, Centeotl is the son of the earth goddess, Toci, and god, Tlazolteotl. The majority of evidence gathered on Centeotl suggests that he is usually portrayed as a young man (although a debate is still ongoing), with yellow body colouration. Some specialists believe that Centeotl used to be the maize goddess Xilonen. Centeotl was considered one of the most important deities of the Aztec era. There are many common features that are shown in depictions of Centeotl. For example there often seems to be maize in his headdress. Another striking trait is the black line passing down his eyebrow, through his cheek and finishing at the bottom of his jaw line. These face markings are similarly and frequently used in the late post-classic depictions of a Mayan maize god. Once a widely respected and beloved crone goddess our Baba loved to hunt down evil folk. She'd fly in her magical cauldron scooping up evil people who had nowhere to hide from her powerful magic. She was a loving mother and goddess help you if you hurt a woman or child. Besides her other duties she could create storms, or produce food for her people. Feasts days in her honor showed all the good things she gave us humans, as well as reminding folk that everything must die but would be reborn or go back to nature in her cauldron. Decent folk had nothing to fear from her and as a kindness she often took them quickly when severe illness set in. People looked forward to meeting her because she had an afterworld stocked better than your grandmother's candy drawer. She could also grant good health and often did so. But as people began to fear death and renounce the dead they came to fear this sweet old crone who wanted nothing more than to help them move on. RENPET is the Egyptian Goddess of youth and springtime. She is depicted in human form with a headdress bearing a notched palm branch which represented the year. Renpet's name means "year" and she was also known as the MISTRESS OF ETERNITY. She is depicted here standing next to Maat (Renpet is on the right). BELISAMA (pronounced Bell-ih-SAH-mah) is the Gaulish Goddess of light and fire. Her husband, Belenus, is the God of the Sun, and she shares many attributes with him. Belisama, whose name means "summer bright", was associated with the Greek Goddess Athena and the Roman Goddess Minerva, and this brought her rule over crafts. Her roles as Goddess of fire and Goddess of crafts combined in her power over the forging of metals and those who worked them, smiths. 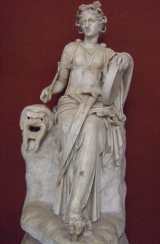 Her association with Athena and Minerva also brought her recognition as a Goddess of wisdom, as shown by the frequent depiction of a serpent at her side. Her name is also seen as BELESAMA and BELISMA. VESTA is the Roman Goddess of the hearth fire. 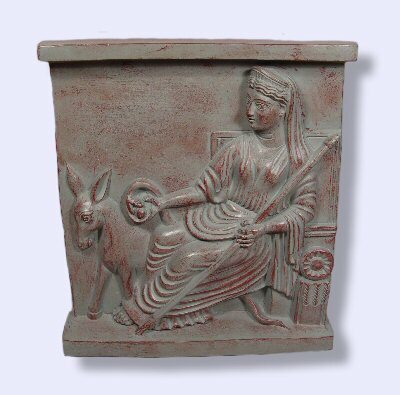 She is the Roman equivalent of the Greek Hestia, and like Hestia, there are few myths associated with Vesta. She was honored in a temple on the Palatine Hill in Rome, in which a sacred fire was tended by her priestesses, the Vestal Virgins. The temple was round with a door facing to the east, and was likely built in the 3rd century BCE. The six Vestal Virgins, who served for thirty years each, made sure that the fire never went out, until they were disbanded in 394 by Emperor Theodosius, after he declared Christianity to be the only legitimate religion of the Roman Empire. 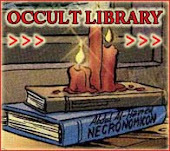 I blush to admit it, but Baphomet may not exist. The most logical explanation we have is that he is one image made from many symbols. Those in the Knights Templar would know what these symbols meant, and respond with the proper gestures or words. Unfortunately, the Church decided it wanted the richer and stronger Templars dead, so he became a devil of sorts. Thankfully of all people Crowley rescued his rep, turning him back into the fertility god he was, if he really was at all. Today he is seen as life, love and all things good. Heck, they make cuddly stuffed animals out of him. Just keep in mind every fertility god has a reaping side as well. FAMA is the Roman Goddess of fame and rumor. She is the daughter of Tellus and Ouranos, making her of the same generation as the Greek Titans, the generation before the popular Gods like Juno and Jupiter. She is said to live at the center of the world on a high mountain. Her home has no doors, but a thousand windows, and she can see and hear everything that happens in the world. Fama never sleeps, always listening for whispers on the wind. Some authors describe her as having great wings, and at the base of each feather is an eye, an ear, and a mouth, so that she can see, hear, and spread her rumors. Most depictions show her with a trumpet, which she uses to call attention to herself before she tells her news. While she does give positive news, such as of victory in battle, she delights more in spreading salacious rumors, regardless of their truth. 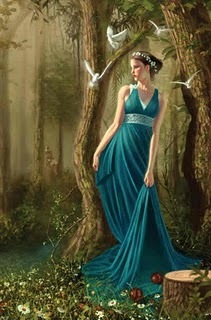 AIGLE (pronounced EYE-glee) is the Greek Goddess of good health. She is one of the daughter of Asklepios, God of medicine, and Epione, Goddess of pain relief. Aigle's name, which means "radiance," is also seen as AEGLE. Athene is one of the oldest and most beloved Deities of the Greek pantheon. She was called Athena by both the Greeks and the Romans. She was born, fully grown and clad in a glorious armor, when She sprang from Zeus's head.. after he had swallowed Her mother, Metis, the goddess of wisdom. Zeus had lived in fear that Metis would give birth to a son who would de-throne him as he had done to his own father, Cronus, so he was thrilled with Athena appeared, and there was no doubt that she was a favorite child of Zeus. Athena is represented as quite a majestic goddess. In Her hands she holds a spear and a shield, and upon her head, a helmet; her breasts covered by a breastplate. She was educated by Triton, the river god and became good friends with his daughter, Pallas. Athena accidentally killed her during one of their games and grieved so much over Her death that she made a wooden image of her likeness...the Palladium. Because the Greek city-states were largely military, Athena is considered a warrior goddess, and most powerful goddess of war at that...but She was also a virgin goddess; meaning that She was a whole unto herself. Her traits include the integration of both masculine and feminine qualities: strength, intellect, and compassion. Her warrior instincts made Her a symbol of matriarchal strength...and because She personified the Greek ideal of rationality and power, She became the patron Deity of Athenians...representing courage and victory. There is a story that Athena and her uncle, Poseidon, the god of the sea, were both very fond of a specific city in Greece, and disputed which of the two could lay claim to the city. It was decided that the one who gave the finest gift should have it. On his part, Poseiden struck the side of the cliff with his staff and opened up a well on the Acropolis, but, alas, the water was very salty and not very useful. Athena, on the other hand, planted an olive tree, symbolic of the Greek Tree of Life. 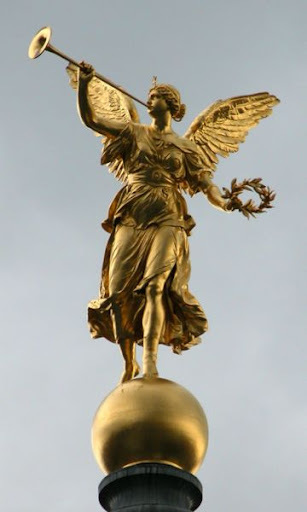 It decided that because Athena's gift would be far more useful to the people, Athena was the winner; hence She became the city's protectress and named the city, Athens. Athena was a benevolent Goddess and had very few ulterior or selfish motives. She seldom did anything. 'just for spite. She was a patroness of art, science, and the crafts of women...especially weaving..and is the epitome of wisdom, enlightenment, maturity and represents the means by which wisdom is born and manifest in our world. She defied the laws of mortals and immortals alike. She is often accompanied by an owl...representing wisdom. Think about the wisdom that you have gathered throughout your lifetime. Give yourself credit for the ways in which you have grown and for the ways you are helping others grow. Appreciating ourselves each day gives us the courage to keep our garden of wisdom growing. "SHITALA" (SHE WHO MAKES COLD) IS THE HINDU GODDESS OF DISEASE, A PESTILENCE DEITY BUT ALSO AN IMPORTANT HEALING FORCE IN THE HINDU PANTHEON. SHITALA IS ACTUALLY ONE OF THE MOST POPULAR HINDU DEITIES WHOSE ORIGIN CAN BE TRACED BACK TO THE DAYS OF NATURE WORSHIP. SYMBOLICALLY, SHE REPRESENTS THE POWER OF VIRUSES WHICH CAUSE DISEASE AND THE HEALING POWER OF NATURE. SHE HAS A STRANGE APPEARANCE, BUT DOES NOT APPEAR AS TERRIBLE AND FRIGHTENING AS HAS KALI IN SOME OF HER MANIFESTATIONS. 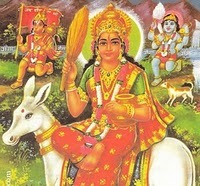 SHE IS USUALLY DEPICTED AS BLACK AND DARK LIKE KALI, WEARING A RED DRESS WHO IS GENERALLY SEEN RIDING THROUGH THE VILLAGE ON A DONKEY. SHE CARRIES A SILVER BROOM, WINNOW FAN, SMALL BOWL, AND A PITCHER OF HOLY WATER FROM THE RIVER GANGE. SHITALA IS A HOT AND DANGEROUS GODDESS WHO, IT IS SAID, CREATED THE DREADFUL DISEASE OF SMALLPOX AND THAT ONLY SHE HAS THE POWER TO CURE THOSE WHO ARE SICK. SHE DESPISES DIRT AND FILTH SO THOSE WHO WISH FOR HER BLESSINGS NEED TO BE RITUALLY CLEANSED--THEIR BODIES AS WELL AS THEIR HOMES. SHITALA IS ALSO THE PROTECTOR OF THE GRANARY, COMMANDER OF THE WINDS, AND GIVER OF AMPLE RAIN, GOOD CROPS, AND ABUNDANT FOOD. AT THE TIME OF THE MONSOON, THE VILLAGERS GATHER AROUND HER TEMPLE, AND WHILE THE WOMEN COOK FOOD, THE MEN SING HYMNS IN SHITALA'S PRAISE IN THE HOPES THAT SHE WILL BLESS THEM WITH A BOUNTIFUL CROP. SHITALA HAS THOUSANDS OF SHRINES THROUGHOUT INDIA, MANY OF WHICH ARE THE SITES OF LONG AND FESTIVE FAIRS. IN FACT, THERE IS HARDLY A VILLAGE IN THE COUNTRY WITHOUT ONE. IT IS COMMONLY BELIEVED IN THE VILLAGES THAT DURING THE DARKNESS OF NIGHT, SHE EMERGES FROM HER TEMPLE AND ROAMS ABOUT LOOKING FOR HER PREYS. WITH THIS IN MIND, THE VILLAGERS, IN PARTICULAR THE WOMEN AND CHILDREN, AVOID GOING CLOSE TO HER TEMPLE DURING THE NIGHT. 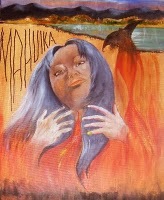 "MAHUIKA" IS THE MAORI MOTHER OF THE FIRE. SINCE THE BEGINNING OF TIME, HUMANS HAD OBTAINED FIRE DIRECTLY FROM HER AND HAD KEPT THEIR CAMPFIRES BURNING SO THAT THEY WOULD NOT HAVE TO GO TO THE UNDERWORLD AND ENCOUNTER "MAHUIKA" AGAIN. SHE IS ASSOCIATED WITH CAVES AND IS RESPONSIBLE FOR FOREST FIRES. IN MOST LEGENDS SHE WAS THE GRANDMOTHER OF MAUI. IN SOME VERSIONS, SHE IS THE YOUNGER SISTER OF "HINENUITEPO," THE GODDESS OF DEATH. SHE MARRIED AUAHI-TUROA, A COMET WHO CARRIED WITH HIM THE SEED OF FIRE, AND TOGETHER THEY HAD FIVE CHILDREN WHO, LIVING IN HER FINGERS ARE SAID TO BE THE FIRST RAYS OF LIGHT THAT SHOOT OVER THE SKY AT DAWN. According to Maori legend, there came a time when fire was almost lost to the world. It seems that "Maui," always the practical joker, decided to extinguish all the fires on earth; his mother then directed the servants to go and ask "Mahuika" to give them fire to cook with. However, the servants were all terrified and refused to obey her, so "Maui" offered to go himself. 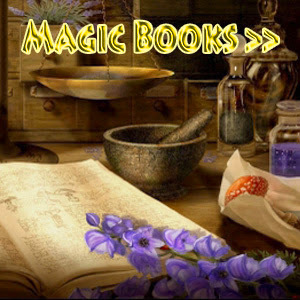 His parents warned him against playing any tricks on "Mahuika", and he promised to be careful. BUT UPON REACHING HER ABODE AND OBTAINING WHAT HE ASKED FOR, HE DECIDED TO PLAY A TRICK ON HER BY EXTINGUISHING THE FIRE ONCE HE WAS OUT OF SIGN AND THEN HE PRESENTING HIMSELF AGAIN. "Mahuika" held out her hands. She then plucked the nail of her little finger and handed it to "Maui". And, each time She tore off a nail, "MAU"I EXTINGUISHED THE FIRE AND ASKED FOR MORE. THEN "MAHUIKA" BECAME ANGRY AND THREW THE LAST FINGER NAIL ON THE GROUND. FIRE POURED OUT AND LAID HOLD OF EVERYTHING. "MAUI "MANAGED TO ESCAPE BY CHANGING HIMSELF INTO A HAWK, BUT BY NOW BOTH THE EARTH AND SEA HAD CAUGHT FIRE. IT IS NOW THAT THE "GOD OF STORMS "STEPS UP AND EXTINGUISHES THE FIRE, BUT BEFORE FIRE WAS LOST ALTOGETHER, "MANUIKA "SAVED SOME SPARKS AND THREW INTO THE "KAIKOMAKO" AND A FEW OTHER TREES...WHERE THEY ARE STILL CHERISHED. HENCE, TO THIS DAY, MEN RUB PORTIONS OF THE WOOD OF THESE TREES TOGETHER WHEN THEY WISH TO IGNITE A FIRE. I've seen a lot of different ways to pronounce Thalia in my searches, but I'm pretty sure that the one I use is correct. Most of the Greek Goddess names have the emphasis on the second syllable, so I know I have that part right. When spelled as Thaleia (or in Greek), it would have been pronounced tha-LAY-uh in Ancient Greek, although the "ei" is pronounced as EYE in Modern Greek, giving tha-LIE-uh. Disagree? Let me know! THALIA (pronounced tha-LIE-uh) is the Greek Muse of comedy and rustic poetry. The nine Muses are the daughters of Zeus and Mnemosyne, and they accompany Apollo in his role as God of the arts. 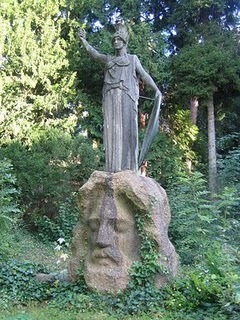 She is usually depicted holding up the comic actor's mask and wearing a wreath of ivy on her head. Sometimes she holds a shepherd's staff, and other times a drum or tambourine--her sons with Apollo, the Korybantes, performed a dance to the beat of drums as part of the Mysteries of Samothrace. Thalia's name, which means "flourishing," is also seen as THALEIA. "NEHALENNIA" IS AN ANCIENT FERTILITY GODDESS WHO IS ASSOCIATED WITH ABUNDANCE AND SEA-FARING; SHE IS HONORED IN THE NETHERLANDS. SHE WAS PROBABLY A GODDESS OF ABUNDANCE AND PROTECTION WHO WAS PARTICULARLY REVERED AS THE GODDESS OF SEAFARERS. SHE IS FREQUENTLY PORTRAYED WITH SYMBOLS OF SEA TRAVEL, SUCH AS AN OAR, AS WELL AS SYMBOLS OF ABUNDANCE SUCH AS A CORNUCOPIA OR A BASKET OF FRUITS. SINCE THIS ALSO SYMBOLIZES FERTILITY, IT SUGGESTS THAT SHE MAY HAVE ALSO BEEN A GODDESS OF FERTILITY. OTHER ASPECTS OF THIS GODDESS ARE THE APPLES SHE HOLDS AND THE DOG IN A PROTECTIVE POSE THAT ALMOST ALWAYS ACCOMPANIES HER. THE DOG AS A SACRED ANIMAL IS ASSOCIATED WITH DIVINATION. IT IS ALSO A CREATURE ASSOCIATED WITH BOTH HUNTING AND THE "OTHERWORLD." THIS SUGGESTS THAT "NEHALENNIA "PRESIDED OVER A WIDE RANGE OF ISSUES SUCH AS HEALING, DEATH, AND REBIRTH, AS WELL AS THE SEA, AND WAS POSSIBLY VIEWED AS A PROTECTRESS OF AND GODDESS OF PROSPERITY IN THIS WORLD AND THE NEXT. MANY OF THE SHRINES DEDICATED TO HER WERE ERECTED BY NAVAL TRADERS, PROBABLY AFTER SURVIVAL OF A STORM WHICH WOULD EXPLAIN HER ASSOCIATION WITH NAVAL VESSELS. AT THE TIME THAT SHE WAS WORSHIPED, STONE ALTARS WERE THROWN INTO THE SEA IN HER HONOR. The triple Moon is a representation of the phases the Moon goes through in its cycle, and its symbolism is also linked closely to the Goddess. The Moon phases which shared an association with the growing seasons are linked with the phases of a woman's life. These phases are described as Maiden, Mother, and Crone. The Maiden stage represents the first stage; it is that time during the Moon's cycle when it is new and waxing to full. It is represented as the time of the Maiden...a young, unattached woman who is full of potential for growth...youth, purity, innocence. As the symbolism hints, this is also a time for beginning new things and a building of energy. Springtime rituals most often involve the Maiden Goddesses. The Mother represents the second stage; it is the time of the Full Moon. Her role is one of fertility, growth, and ripeness. She is also in a position of power. She is represented by a pregnant woman both in body and in mind, nurturing and protective. This period symbolizes a time of fruitfulness, a time when our plans are actualized. Summer and fall rituals most often involve the Mother...when crops are growing and harvested. 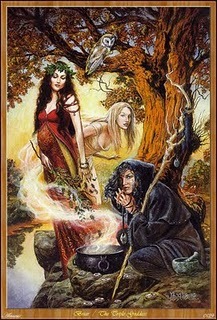 The Crone represents the final stage; it is the time of the Waning Moon. It is represented by an old woman full of wisdom earned with the struggles of learning and bringing forth, offering guidance. This is the woman at the end of her life, ripe with experience. She is symbolic of wisdom, experience, change, transformation, and death. Winter is Her season. Working with the Crone is related to rituals which involve the ending of things...such as a job, a relationship, menopause. It is important that during this cycle of our lives that we not allow our bodies to vegetate, but must continue to exercise in whatever way suits each of us. It is important for us to take the time to learn new skills and expand on the old ones; you are NEVER to old to learn. At 52 I became a certified substance abuse counselor, at 56 I got a bachelor's in criminal justice, at 58 I began taking my Druid courses, at 60 I became a Bard, and now at 62 I am working towards my Ovate certificate. Each one of us must come to terms, sooner or later, with the Dark Mother or the Crone aspect of the Goddess, the winter of our lives. And each of us will find out that there is no such thing as eternal youth no matter how hard we may try to find it. Both men and women go through this stage when their hormones decrease and and their bodies begin to change. It is a time in life to look over our lifetimes with introspection, by remembering the good times with gladness and the bad times for the wisdom they gifted us with. After yesterday's post, I was recalling a very sad incident that happened when I was in my 40's...I worked a 4 pm to 12 am shift and as I entered the train station I notice a woman who was walking along in front of me. She was dressed in a red fuzzy sweator, ultra-short black leather mini-skirt, fishnet stockings, and and stiletto black heels. Her crowning glory was her magnificent mane of golden blond hair which fell almost to her waist. And as she walked, I noticed that everyone, man and woman alike, couldn't help but watch her as she passed by...and now I was more than a little intrigued. "Who was this woman and what did she look like? She must be beautiful...otherwise, why else would she be drawing so much attention to herself. And, I don't care what a woman says, we WANT to know what the competition looks like, so I sped up to catch up and pass her. And, I have to tell you, I was totally caught off-guard by what I saw. Contrary to my initial belief, this was no beautiful model/actress type; indeed, the poor woman must have been in her late 70's close to 80. Her face was matted white with far too much powder; her cheeks were like flame. Her eyelids were coated with a thick, caked blue shadow, and she wore a bright red lipstick which she had drawn over her thin, shriveled lips in an attempt to make her lips look large and pouty....And the poor thing was smiling from all the attention she was getting; you could just tell she thought it was the greatest by the way she was strutting her stuff. I promised myself that day that that would NEVER be me, but, one day I realized that that WAS me....maybe not as blatant as she, but I was a woman who one day looked into the mirror and saw someone looking back who had not yet become comfortable with her age. The hairdo, a ponytail piled high atop the head, was a sharp contrast to the furrowed brows. The dark shadow and thick lashes only served to accentuate the undereye crowsfeet and dark circles. The red lipstick looked too sharp, too aging. So now, at 63, well almost 63, I wear the minimal of makeup...a tinted moisturizer, a light blush, a thin coating of mascara, and a brownish pink lipstick. My hair is now mostly pulled back into a low pony tail and I dress in clothes more appropriate for my age group....And you know what? I feel so much better about myself now. I am not trying to be someone I am not. So, here's to all of you....the Maidens, the Mothers, and the Crones. Be yourself. Maidens, don't try to grow up too quickly. There is time enough for that. Mothers, cherish what you have. And Crones, be the wise woman life has made you to be. PARVATI is the Hindu Goddess of love and devotion. She is the second wife of the Lord God Shiva, forming a trinity with Lakshmi (wife of Vishnu) and Sarasvati (wife of Brahma). After Shiva's first wife, Dakshayani, killed herself in shame because her father had insulted Shiva, he withdrew from the world and spent his days meditating in a cave. At this time, the Gods had been driven from heaven by demons, and without Shiva, they were hard-pressed to defend themselves. The Gods went to the mother Goddess, Shakti, to find a solution. Shakti said that only a son of Shiva would be able to defeat the demons, and she volunteered to be reincarnated as the Goddess who would persuade Shiva to create this new God. 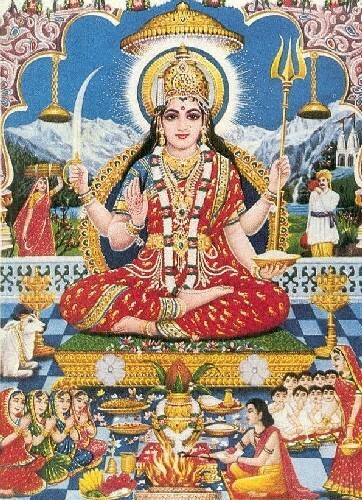 Shakti was reborn as the daughter of Himavat, God of the Himalayan mountains, and Mena, an asparas or nymph, and was named Parvati, "she of the mountains". Parvati quickly found Shiva in his cave, and brought him gifts of fruit and flowers every day. Shiva ignored her, partly because he found her dark skin unattractive. Parvati decided to try something different, and withdrew into the mountains to develop her own spiritual powers, hoping that this would attract Shiva's attention. She lived in the forest with no food or clothing and soon mastered her physical needs. Her powers grew to such heights that the supreme God Brahma took notice. After Parvati told him the story of her love for Shiva and his indifference to her, Brahma told her that he would grant her one wish. Knowing that Shiva disliked her dark skin, Parvati asked for golden skin instead. Brahma took away the darkness, creating the Goddess Kali with it. When Shiva saw Parvati with her new golden skin, he was struck by her beauty and power, and agreed to marry her. Parvati, remembering the reason why she was incarnated in the first place, gave a portion of Shiva's aura to the Gods, which they used to create the war God Skanda. Skanda defeated the demons and gave heaven back to the Gods. Parvati, meanwhile, longed for a child of her own. Shiva did not wanted to be bothered with children, so he gave her a piece of cloth and told her to make a doll and pretend that it was her child. Angered and hurt, Parvati left Shiva to live in a cave, taking the cloth with her. Parvati's tears fell on to the cloth and it was transformed into the God Ganesha. Ganesha's first encounter with his father came shortly thereafter. Parvati had asked Ganesha to guard her cave and not allow any strangers to enter. Shiva, regretting his actions toward his wife, came to ask for her forgiveness, but Ganesha did not recognize him and would not permit him to pass. Shiva grew angry with this obstacle to his wife and, not knowing that Ganesha was his son, beheaded him. When Parvati discovered what had happened, her grief was immense, and Shiva promised to find a new head for his son. He could only find the head of an elephant, and used it to bring Ganesha back to life. Through all her ordeals, Parvati's love for Shiva never wavered. She is an affirmation that women can do whatever they set their minds to, no matter what obstacles they face. It is said that Parvati is the source of all power in the universe and that Shiva's powers derive from her. Variations on her name include PARVARTI, PARVATHI, and PARVATHY. ACCORDING TO MYTHOLOGY, THE "SPRING EQUINOX" IS THE TIME, THAT "PERSEPHONE," THE GREEK GODDESS OF SPRING, STARTS HER JOURNEY BACK TO EARTH AND HER BELOVED MOTHER, " DEMETER." 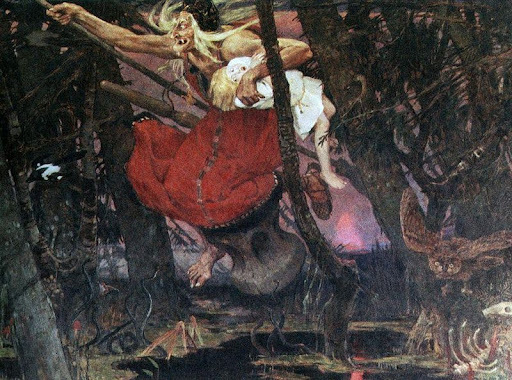 EACH YEAR AT THE END OF THE WINTER SEASON, SHE RETURNS TO THE SURFACE OF THE EARTH FOR A JOYFUL REUNION WITH HER MOTHER. IN WINTER, SHE RETURNS TO LIVE IN THE "UNDERWORLD" AS THE "QUEEN OF HADES." PERSEPHONE" IS THE "GODDESS" OF DEATH, YET WITH A PROMISE OF LIFE TO COME. Persephone loves helping her mother, "Demeter," cover the Earth with plants and seeds. When Hades snatches Persephone to be his wife in the underworld, "Demeter" will not rest until She gets her daughter back. "I" WILL NOT LET ANYTHING GROW", SHE CRIED, AND THE EARTH GREW COLD AND BARREN. HER SADNESS OVER THE LOSS OF HER DAUGHTER WAS SO DEVASTATING THAT HER TEARS FELL AS ICE. FINALLY "DEMETER" WENT TO HER BROTHER, "ZEUS" AND PLEADED WITH HIM TO HELP FIND "PERSEPHONE. ZEUS," SITTING WAY UP THERE ON TOP OF "MOUNT OLYMPUS," WAS ABLE TO SEE WHERE "PERSEPHONE" WAS. HE TOLD "HADES" TO GIVE HER BACK. BUT "HADES" WAS SHREWD AND SAID HE WOULD ONLY GIVE "PERSEPHONE "BACK IF SHE HAD REALLY NOT EATEN OR DRUNK ANYTHING FROM THE LAND OF THE DEAD. NOW, AS IT TURNS OUT, "PERSEPHONE" HAD ALREADY EATEN SIX POMEGRANATE SEEDS. SO, IT WAS AGREED THAT SHE COULD SPEND SIX MONTHS A YEAR ABOVE GROUND WITH HER MOTHER, BUT SHE WOULD HAVE TO SPEND THE OTHER SIX MONTHS IN THE LAND OF THE DEAD WITH "HADES." And so it is that AT THE TIME OF THE "SPRING EQUINOX, PERSEPHONE "BEGINS HER JOURNEY OUT OF THE UNDERWORLD. OVER THE COLD DARKNESS OF THE WINTER "PERSEPHONE" AND "HADES" HAD REUNITED, AND NOW SHE BEGINS TO HER ANNUAL RETURN TO THE LIGHT. DAYLIGHT AND DARKNESS ARE EQUALLY REPRESENTED AT THE "SPRING EQUINOX "AS "PERSEPHON"E HOLDS THE BALANCE BETWEEN HER TWO SEPARATE WORLDS. "Blessings to all of you at this most special time of the year."